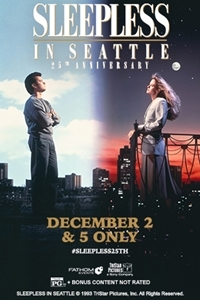 Fathom Events and TriStar Pictures are proud to present Sleepless in Seattle 25th Anniversary, coming to select cinemas on December 2 & 5, featuring an exclusive introduction. After his wife Maggie passes away, a devastated Sam Baldwin (Tom Hanks) and his 8-year-old son Jonah relocate from Chicago to Seattle. On Christmas Eve, Sam ends up pouring his heart out on a national radio talk show about his perfect marriage to Maggie, and how much he still misses her. Among the many women who hear Sam's story and fall in love with him solely because of it is Annie Reed (Meg Ryan), a Baltimore-based newspaper writer. A pure and romantic classic, can 'Sleepless in Seattle' find true love again?